Your connections are posting articles, commenting on the activity of others, and starting group discussions—and you can see all of this from your main LinkedIn feed. This provides a perfect opportunity to inject yourself into conversations. Of course, only do this when you have something to say, such as an answer to someone’s question, a follow-up question of your own, or a congratulations of some sort. Don’t just hit the Like button; that’s a lazy form of engagement and won’t get you any type of recognition or build your brand in any meaningful way. When you’re editing your LinkedIn profile, you can add to the list of Skills you possess. LinkedIn will often prompt your connections to endorse their own connections’ proficiency in various skills. Let’s say that you, Milton Butters, add the skill “Juggling” to your profile. Your connections will occasionally be asked, “Does Milton Butters know about Juggling?,” and they’ll have the option to hit the “Endorse” button. The more endorsements you get for that skill, the more people will think you’re a lean, mean juggling machine, and all those juggling recruiters will beat a path to your door. When you’re deciding what to focus on with respect to your LinkedIn profile, start with what comes up first, beginning with the top of your profile. Headlines are incredibly important to your LinkedIn profile. After all, they sum you up in a nutshell. If the first thing you want people to know about you is that you’re a keynote speaker, then that absolutely belongs in the headline. If you are actively exploring new opportunities, that’s the kind of thing you need to consider putting in the headline, as well. For your company, include a short but detailed description, so your audience can see exactly what the company’s focus is. While plenty of professionals know what Firebrand Group does, Jeremy doesn’t want to take for granted that his audience will necessarily know that it is a futureproofing firm focused on helping enterprises predict the future of marketing and communications and getting there before their competitors do. Of course, visual content matters too. One thing I notice often on LinkedIn—which annoys me to no end—is when people post pictures that are way too small for LinkedIn’s dimensions. Make sure that you view your profile from both a phone and a browser to ensure that you’ve optimized it for all types of devices. You’ve put too much effort into your LinkedIn presence not to. 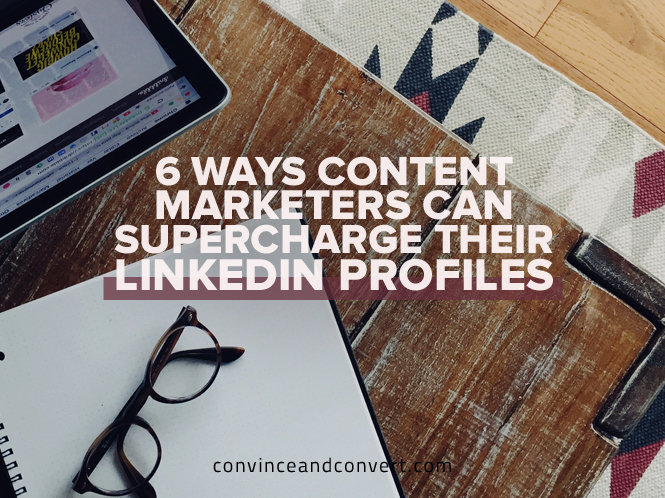 One of the most important content elements within your LinkedIn profile is your summary. People will read your headline first, and if you’ve enticed them into reading your profile, the number-one thing they’ll read next is your summary. Think of your summary this way: If you were introducing yourself to someone, and you only had 15 seconds, what would you want to get out of your mouth before you run out of time? If you live and breathe museum research, you’ve got to make sure to relate that immediately in your summary. If you happen to have a Pez candy dispenser collection that is unrivaled in the entire country, which is interesting but in no way defines you professionally, maybe leave that out. Don’t just think about content you’re developing yourself; think of elements that are going to be dropped in from others, such as Recommendations. In fact, getting Recommendations on LinkedIn is one of the most underrated tactics in personal brand-building. Unlike Endorsements, which are your connections’ ways of saying you’re good at specific skills, Recommendations are completely free-form. Your colleagues can write as much or as little as they want. Of course, people have to love you to spend five minutes crafting a nice note about you. To improve your odds of getting a few recommendations, why not write some for those you hold in high esteem? After all, it’s better to give than receive. Once you write a recommendation for others, LinkedIn may ask if you want to send them a brief note asking for one in return. While requesting a recommendation, you can mention some of the attributes that you’re looking to emphasize. If you’re working at a biotech startup and looking to pivot into strategy consulting, you can request recommendations highlighting your decision-making, strategic mind, and consulting-relevant projects you have previously tackled. Give people options. Don’t just say you want recommendations purely focused on your ballet skills. If the person you’re asking for a recommendation has never seen you do a plié or a pirouette, they might not feel comfortable giving you a ballet-related recommendation. Instead, give them roughly four things you want to be known for, which gives them options without boxing them in. Want more on how to build your brand using the latest digital tactics? Check out Getting to Like, my latest book (with co-author Ali B. Zagat), where we cover everything from analytics to content development to picking your social media channels, and more. Jeremy is the founder and CEO of Firebrand Group, an award-winning futureproofing firm focused on building powerful brands through innovative digital marketing and social media strategies. Jeremy is a recognized branding expert, having been featured in the Wall Street Journal, BBC, Mashable, CNBC, and more. Business Insider calls him “one of the 25 Most Influential Ad Execs On Twitter.” Jeremy's latest book, Getting to Like: How to Boost Your Personal and Professional Brand to Expand Opportunities, Grow Your Business, and Achieve Financial Success (with co-author Ali B. Zagat) is now on sale.